A record breaker in its native homeland when released last year, producer Konstantin Ernst describes his Russian horror epic Night Watch as “Tarkovsky meets the Wachowskis”. 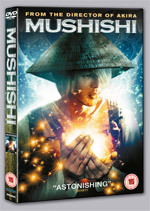 Whilst this is a fairly accurate description – don’t let it put you off, as in reality Night Watch doesn’t really contain any of the high-reaching yet sleep-inducing themes for which Tarkovsky was known, and neither does it plummet to the faux-philosophical meanderings of the last two Matrix films either. It’s a whole Other. And what a dark refreshing Other it is too. 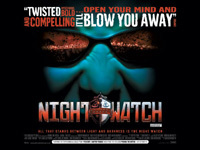 Based on the Russian sci-fi novels by Sergei Lukyanenko, Night Watch was filmed on a budget of $4 million (which included filming all the actor’s scenes for the upcoming sequel Day Watch) and took $16.5 million at the Russian box office. That’s no small change in anyone’s books, and Fox were the first to sniff out it’s potential, buying up the international rights to both opening films and agreeing to make the final chapter to be called Dusk Watch. Fox made a few scene deletions here and there, added in some music by Hans Zimmer (the reason Fox has been so specially secure with the various festival screenings it has received recently), replaced the original closing-credits Russian rap record with a Feeder single, added in an English opening prologue voiceover and then subtitled the rest of the film with some truly groundbreaking subtitles (they move, change size, and in the case of some vampire speech, they turn red and drip off the screen). Finally released in the UK on October 7th, Night Watch (the international version) is definitely worth the wait and will no doubt prove to be either a huge cult smash or a minor mainstream hit, whichever you prefer. Night Watch (first part of three, don’t you know) opens with an English voiceover setting the scene. One thousand years ago, the forces of Light (led by Geser) and the forces of Darkness (led by Zavulon) met on a bridge and engaged in battle. Realising that both sides were evenly matched, Geser called for a truce between the opposing sides, enabling the good folk (witches, seers, sorcerers and shape-shifters) to co-exist with the dark dudes (vampires and er.. more vampires), a truce that still holds firm today. Modern day, and Anton (Khabensky) is an Other with the Night Watch, the forces of Light who police the night to ensure the Dark Ones don’t break the agreement. Still trying to live with himself after losing his girlfriend and almost killing his unborn child 12 years ago, he answers the call to seek out and protect a young boy (Yegor) who is being lured to his death by vampires. Racing through the subway, Anton just about manages to track the boy down in time and saves his life in a stunning fight sequence featuring tricksy camera shots, mirror shards and Night Watch truck headlights that results in a shattering death for the male vamp. With so much to cram in from the novel Night Watch hardly pauses for breath from it’s opening ‘flashback’ introduction of Anton, a stunning sequence in itself featuring the first appearance of Bear and Tiger Cub, a doll with spider legs (“Little Masha!”) and our first glimpse into the otherworld of ‘The Gloom’. Throw in accompanying visuals that are simply outstanding and some great flashy subtitles and it’s hard to know whether to try to concentrate on the story, the characters or the pure ‘indie’ Russian beauty of it or just let yourself go and let it all wash over you as you sit there in a daze not having a clue what’s going on. Yet despite it’s initial confusion (believe me, it works a lot better on a second viewing), Night Watch is always watchable. Russian advertising director Timur Bekmambetov is clearly trying to ape Hollywood, but his showcase of visual trickery here on a miniscule budget must surely be applauded. From stunning crane shots of outdoor swimming pools, to endless time-lapse / time-speed photography and decent CGI, the film is a constant visual delight, with the journey of a bolt falling from an aeroplane through the sky, down a grill before plopping into one of the character’s cups of coffee being a particular highlight. Other nice scenes include the cool flashback animation explanation of the Legend of the Virgin of Byzantium, Anton’s new partner Owl revealing her human form (“Were you afraid?” “The shower.. It’s there.”), the appearance of Buffy on TV and Anton, Owl and the young boy, Yegor’s first visit to The Gloom, including some terrifically harsh fantasy violence whereby Anton repeatedly slashes his arm. Konstantin Khabensky as Anton makes for an engaging lead hero, the Light mage with a Dark past. As much as victim as a saviour, Anton is world-weary, unloved, yet still a noble guardian for forces of good, the Star Wars ‘Obi-Wan’ of the saga. Yet, as is usually the case, the baddies make the best impression with an ‘Emperor’ like turn from Viktor Verzhbitsky as Zavulon, and the gorgeous Isabella Rosselini look-alike Zhanna Friske who plays Alisa (we can only hope to see more of her in Day Watch). With such a furiously-paced opening, the film may seem to kick its heels a little towards the end (especially if you’ve forgotten who was who, which isn’t that difficult), but with a final oh-so-teasing ending that features a great spine sword slash computer game stand-off, it’s almost impossible not be drooling with anticipation of its sequel to be released in Russia on New Years Day 2006. The US and European cut is shorter than the original Russian release. "Now, this is how you start a film." Rawshark's right.